Enzyme inhibitors are small molecules and ions capable of binding to enzymes in order to reduce their catalytic activity. 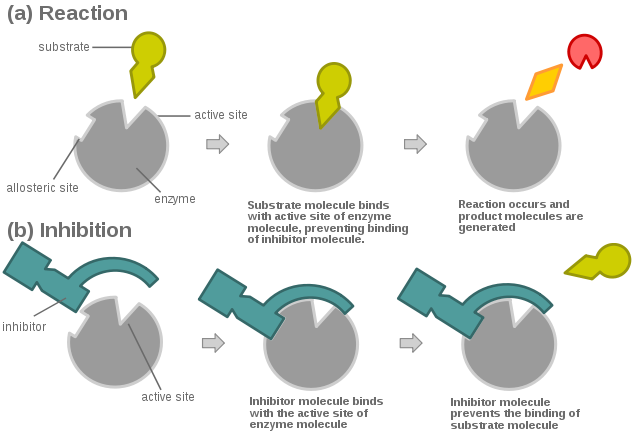 Enzyme inhibition is an important control mechanism in biological systems. In addition, it is the process used by many drugs in the effective reduction of disease-mediated enzymatic activity. Enzyme inhibitors may be classified as irreversible and reversible. What is Irreversible enzyme inhibitors? Irreversible inhibitors bind tightly to the enzyme, thus dissociating very slowly from it. They can form either covalent or non-covalent bonds with their target. Many important drugs, such as penicillin, are irreversible enzyme inhibitors. Penicillin is an antibiotic capable of killing bacteria by covalently binding to the enzyme transpeptidase, therefore preventing the synthesis of the bacterial cell wall. Another example is aspirin, which forms covalent bonds with the enzyme cyclooxygenase, resulting in the reduction of the inflammatory processes. Irreversible inhibitors can be classified into three categories: group-specific reagents, substrate analogs, and suicide inhibitors. Group-specific reagents can bind to a particular amino-acid residue of the enzyme and irreversibly modify it. They are, therefore, less specific, being able to interact with many enzymes. Substrate analogs present a similar structure to the substrate of the enzyme and can covalently modify its active site residue. Suicide inhibitors are the most specific enzyme inhibitors. They bind as a substrate to the enzyme and are processed through the catalytic reaction. The catalysis then generates an intermediate that covalently inactivates the enzyme. What is Reversible enzyme inhibitors? Reversible inhibitors form non-covalent bonds with the enzyme. They are characterized by a rapid dissociation from their target. Reversible inhibitors can be classified into two main categories, competitive and non-competitive inhibitors. A reversible inhibitor is competitive when the enzyme can bind with its active site, either to the inhibitor forming an enzyme-inhibitor complex (EI), or to the substrate forming an enzyme-substrate (ES) complex. In this case of competitive inhibition, the binding of the enzyme to the substrate or to the inhibitor are mutually exclusive: the enzyme can never bind to the inhibitor and to the substrate at the same time. The reduction of the catalytic activity of the enzyme is achieved by the reduction of the proportion of the enzyme-substrate complex. Increasing the substrate concentration can relieve the inhibition of the enzyme. 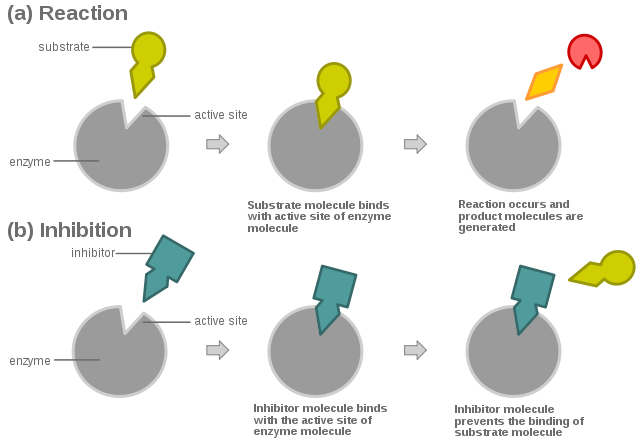 In the reversible non-competitive inhibition, the substrate and the inhibitor bind simultaneously to different sites of the enzyme, rendering it inactive. This inhibition cannot be overcome by increasing the substrate concentration. Irreversible enzyme inhibitors and reversible enzyme inhibitors are capable of binding to enzymes and reducing their catalytic activity. Irreversible inhibitors bind tightly to the target enzyme, and the dissociation of the enzyme-inhibitor complex is very slow. The inhibition effect is irreversible. Reversible inhibitors, on the other side, are characterized with a rapid dissociation of the enzyme-inhibitor complex. The inhibition effect is reversible. Irreversible inhibitors can be classified into three categories: group-specific reagents, substrate analogs, and suicide inhibitors. Reversible inhibitors are classified into two groups: competitive and non-competitive inhibitors. Irreversible substrate analogs and reversible competitive inhibitors act similarly by imitating the enzyme-specific substrate. Substrate analogs irreversibly modify the active site of the enzyme, while the competitive inhibition can be reversed by increasing substrate concentration. Irreversible and reversible enzyme inhibitors are molecules capable of binding to enzymes and inactivating them. While irreversible inhibitors act more permanently by modifying active sites and slowly dissociating from their target enzyme, reversible inhibitors are characterized by a rapid dissociation from the enzyme and their inhibition activity can be easily reversed. Lyne Chahine-Böhme. 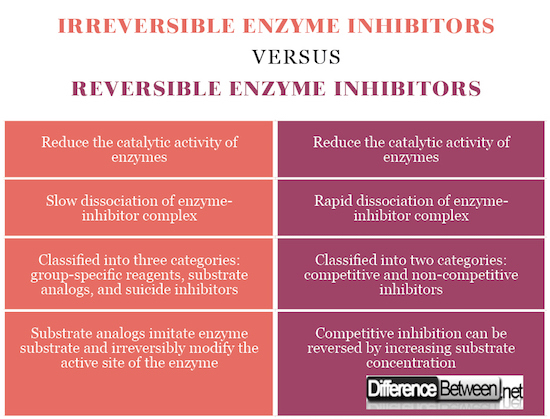 "Differences Between Irreversible Enzyme Inhibitors and Reversible Enzyme Inhibitors." DifferenceBetween.net. May 17, 2018 < http://www.differencebetween.net/science/health/differences-between-irreversible-enzyme-inhibitors-and-reversible-enzyme-inhibitors/ >. A brief introduction to enzyme inhibitors -Nonspecific, Irreversible and reversible (competitive, uncompetitive and non-competitive) inhibitors. February 8, 2017.